As the title suggests, is released Godot game engine 1.0 (open source). Godot is an advanced multi-platform game engine 2D / 3D, which contains many tools for applications in real-time. Originally developed by OKAM as proprietary engine, has been used for many games published worldwide. Works with Windows, OSX and Linux, and can produce games for PC, mobile, and web platforms. Uncluttered UI, where most tools are context-sensitive. Huge amount of tools to aid you and your team in content creation. Editor designed not only for programmers, but for artists,animators, level designers, graphic designers, game designers, etc. Built-In documentation browser and code editor to avoid distractions. Godot works on Windows, OSX and Linux. Editor runs in 32 and 64 bits, in all platforms. Small download (around 20mb), and you are ready to go. Easy to compile yourself (no dependency hell). Upcoming (not stable yet): HTML5 and Windows Phone. One Click Deploy & Export to most platforms. Easy to create custom builds too. Dedicated 2D engine, no need to fake 2D in 3D space. Work in pixel coordinates, but resize to any screen resolution. Support for sprites, animated sprites, polygons, parallax, layers, advanced particle system, etc. Custom physics & collision engine that works in pixel coordinates. Powerful animation editing capabilities, including cut-out, bone rigs, etc. Import 3D models from Max, Maya, Blender, etc. with full animation. Supports skeleton deforms and blend shapes. Several light types, with shadow mapping. Flexible shader & material models. Render with HDR, anti aliasing and linear color modes. Post process fog, glow, bloom, color adjustment, etc. Powerful GUI library, dozens of controls are available as engine nodes. Entirely visual GUI editor, design first and then fill the bits of code. Create beautiful game UIs with simple, skinnable controls. 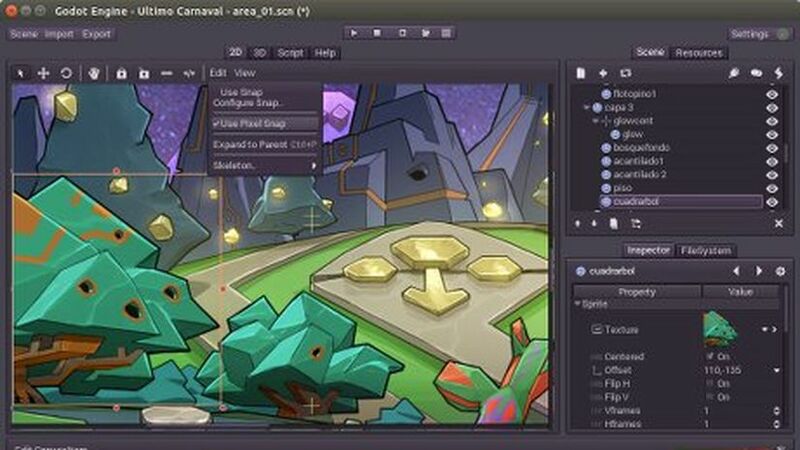 Create tools and game content editors using advanced controls. Skinnable OS-like controls, for sim games, RPGs, MMOs, etc. Customize your own controls, by implementing input and draw functions. Python-based scripting language, designed to make games. Efficient design for memory allocation (no GC stalls or leaks). Built-In script editor with syntax highlighting, real-time parser & code completion. Friendly C++ API to extend any part of the engine. Dedicated 2D and 3D physics engines, which use the same API. Several types of collider shapes supported. Flexible KinematicBody implementation, for 2D and 3D. KinematicBody allows to use collision detection in a flexible way, without physics. Advanced DynamicCharacter for characters that need full, transparent physics integration. Several types of constraints available, including Vehicle Simulation.